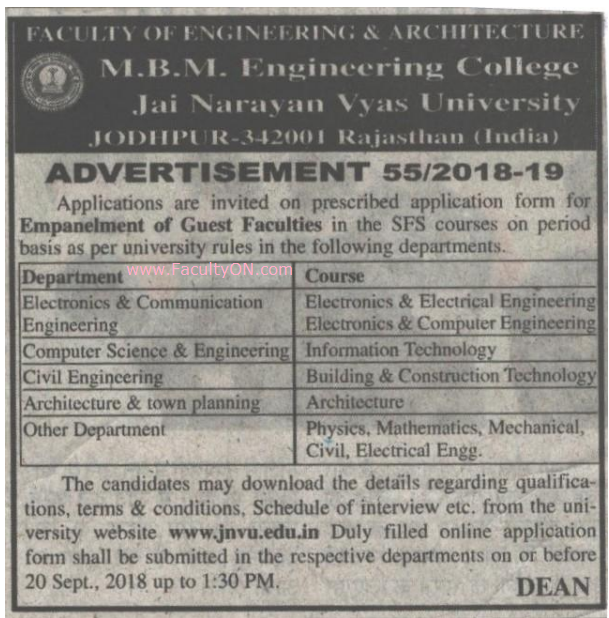 M.B.M.Engineering College, Jodhpur has advertised for recruitment of Assistant Professor jobs vacancies. Interested and eligible job aspirants are requested to apply on or before 20th Sept 2018. Check out further more details below. About College: MBM Engineering College is one of the oldest engineering colleges in India. Established on 15th August 1951 by the government of Rajasthan, the college boasts of its high academic & technical standards. Considered as the pioneering Technical Institution of the State, it offers a gamut of courses both at PG and UG level. The college is committed to providing its students with an education that combines rigorous academic study and developing a far more ambitious, integrated and influential environment that will best serve the nation. How to Apply: Interested and eligible candidates are requested to apply ONLINE at the web link provided below and submit the filled-in form along with copies of certificates and recent PP size photos to the postal address (respective departments) mentioned below. Reference: Recruitment Notification / Career Job Opportunities notice by M.B.M.Engineering College, Jodhpur on for Guest Faculty Vacancy 2018.